The 2011 Native American Dollar will mark the third year of the series created to highlight the contributions and accomplishments of Native Americans. 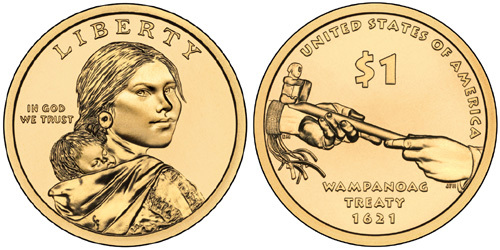 A unique reverse design is featured annually, together with a modified version of the obverse from the Sacagawea Dollar. The theme for the latest release will be Diplomacy – Treaties with Tribal Nations. The reverse design selected to represent the theme focuses on the first written treaty between Native Americans and European settlers. The hands of Supreme Sachem Ousameqin, Massasoit of the Great Wampanoag Nation and Governor John Carver of the settlers at Plymouth Bay are shown exchanging the ceremonial peace pipe. Inscriptions on the reverse include “United States of America”, “Wampanoag Treaty 1621″ and the face value “$1″. Designed by Richard Masters and sculpted by Joseph Menna, this reverse was chosen from six different original design candidates. The United States Mint will produce the 2011 Native American Dollars for circulation at the Philadelphia and Denver Mint facilities. By law, at least 20% of all dollar coins issued during the year must be Native American Dollars. Additional collector versions of the coin may be struck for inclusion in numismatic products.